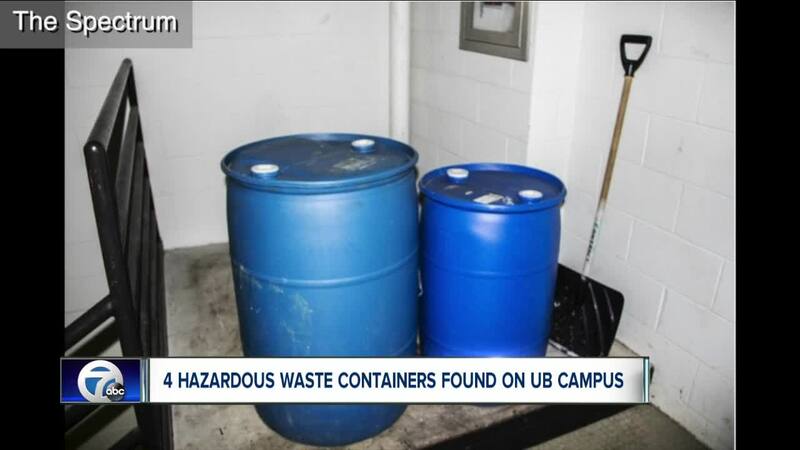 This discovery comes three months after an audit by the New York State Comptroller found there were concerns about the way UB handled hazardous materials. BUFFALO, N.Y (WKBW) — About two weeks ago, Benjamin Blanchet wanted to start a project showcasing the history behind signs, plaques and memorials around the University at Buffalo. So he began exploring the Biomedical Education building with colleague Thomas Zavonte one day. "I was just walking through a stairwell, and I noticed like a strong odor. And I walked up the stairwell and I discovered these two blue barrels at the top of the stairwell," said Blanchet. The two containers, now removed, were empty. But the two college newspaper reporters said they had to cover their noses as they got closer. According to an article they wrote for the university's newspaper, this was an area accessible to students and the public. The two student reporters said they found additional containers in another area that is supposed to be locked. "There was a doors labeled "Restricted Access" and I just pushed it and it was open. And I walked down the hallway and I discovered two white containers," said Blanchet. "One one of them had liquid labeled Acid Power and then the other one did not have any liquid in it." Auditors said there was a lack of accountability and poor oversight on the North, South, and Downtown campuses. Blanchet said the containers were found on Friday March first, and that they were still there on Monday March fourth. He said the corrosive materials in the containers can be harmful if they come in contact with skin. A representative with the university said three of the four containers were empty, and there were no hazardous waste materials, and no risk to the university community.